Exhibition Of Paintings By Achuthan Kudalur is an event that took place between 17-Feb-2006 and 15-Mar-2006 in Hyderabad. If you aren't much of an appreciator of abstract art, you might just be better off staying away from this exhibition. You won't see much except large rectangles of colour. On sale are a Blue Image, Black Image and Red Image, abstract representations of...ahem...we are not quite sure what. Nevertheless, be aware that Achuthan Kudaloor is a very reputed, senior artist whose paintings are a rage and much in demand among the knowledgeable conossieurs. He was born in 1948 in Palghat and is a full-time artist whose works and writings have established him as a scholar who understands art. In 1988, he won the The National Award conferred by the Lalith Kala Academy, New Delhi. He was also made one of the commissioners for selecting Indian entries for the Ninth Triennial – India. He has organized 16 solo exhibitions so far in India and abroad. "Achuthan’s works are known for this nature, abstract compositions, the schematic presentation of an idea, without being cold schematization or an inanimate effort. Although none of his works represents a recognizable animate abject, the overall effect of each painting is imbued with unbounded energy and is capable of tickling one’s mood. He achieves this distinctive quality, a hallmark of his works by imaginatively placing certain linear forms or by using free-flowing placement of abstract forms and colour. 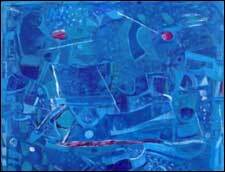 His abstract compositions are distinctly his own, which are different from other painters of non-figurative works. Art lovers would eagerly wish to enjoy more of his future creations." Please contact 2354-0023, 2360-7151 for further details. Be the first to comment on Exhibition Of Paintings By Achuthan Kudalur! Just use the simple form below. fullhyd.com has 700,000+ monthly visits. Tell Hyderabad what you feel about Exhibition Of Paintings By Achuthan Kudalur!